Explain the hundreds of worldwide Earth impacts from a YEC perspective. If these impacts were young we wouldn't be here! No record, no 'impact' on humanity and the development of civilization, exists. I would like to pose a question, and if any YEC can postulate a response, as to how could the Earth be so young as implied by the YEC interpretation, and still sport the number of and apparent age of so many devastating impacts on its surface. One further caveat: While YECs get some mileage out of the idea the universe might be old and the solar system young (a la Humphreys WHC), I really don't see any way the Moon and Earth (specifically, and Mercury, Mars, the asteroids, and rocky moons of Jupiter more generally) could possibly sport the scars they do in a young solar system. To make things clearer, these are very destructive events. If they occurred before the fall, that is a can of theological worms. So they did not occur before the fall. If they occurred after the fall but before the flood (so they can get eroded really well by the flood), REALLY? 172 impacts over 2000 years, with 6 of them creating craters >100km across and we all didn't notice (let alone survive). If they occurred during the flood � my, my, 1 year, 172 impacts, some of them going through the miles of water to create >100 km craters. Imagine the tsunamis from those blokes! Noah's ark was theoretically tough and stable, but I doubt it was that tough! So we're left with they occurred after the flood. Then how did they get so eroded? How did mankind survive? How did we not notice these huge impacts? his is an answer to those that may be under the impression that the 'impact craters' evidence supports millions or billions of years thereby refuting the YEC position. It is not claimed that this is the only possible answer or even the best one. Let's first summarize their case: if this 'impact craters' evidence is exactly what people claim or believe it to be then it would indeed be fairly conclusive. To wit: it is claimed that there are over 170 confirmed impact sites on Earth. 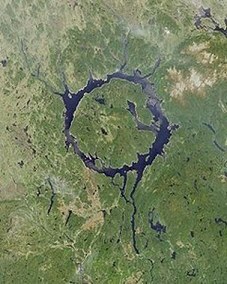 If true, these impacts would have been from objects that ranged in size from a few meters up to several kilometers in diameter, traveling at speeds of multiple-kilometers per second, unleashing from tens to millions of megatons of energy upon impact while producing craters up to several hundreds of kilometers across. Such events would undoubtedly have been noticed, recorded and would have changed the world very significantly had they occurred anytime in the last six thousand years. There is no historical account (that I'm aware of) of such events. The closest candidate would be the Tunguska Event in Russia, June 1908. However, this event did not produce any crater. Before proceeding, let's look at some pictures: Figures 1 through 12. These photographs are from Wikipedia and are used with (extended) permission. 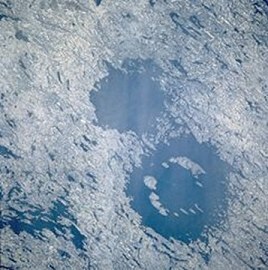 Using impact craters as positive evidence for an old Earth (or, in the negative, as refuting evidence of YEC claims) hinges on one thing: whether or not these craters are exactly what people claim or believe they are. 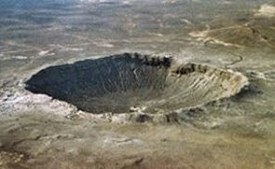 The strength of the argument thus rests entirely on validating the evidence; i.e., are impact craters actually impact craters? In real estate the point to remember is, 'location, location, location!' In these discussions we must always keep in mind, 'interpretation, interpretation, interpretation!' Creationists far too easily doubt, retreat and even capitulate when seemingly 'conclusive' evidence like this is presented. As you are about to see, it's not that difficult here to retain the Creationist position without abandoning reason or science. A person not knowing any better might think that Figures 1 and 2 show impact craters - they do not. 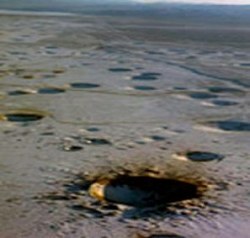 Figure 1 is the Storax Sedan crater, resulting from an underground nuclear explosion in 1962. 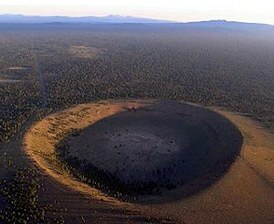 The Sedan crater is 390 meters in diameter and 100 meters deep. Figure 2 shows a section of the Nevada Test Site where numerous underground nuclear tests were conducted. 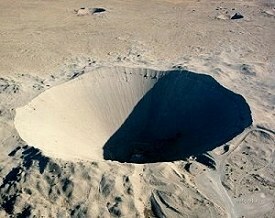 The many craters seen in this picture resulted from those explosive tests, not from impacts. 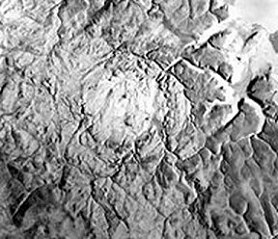 Figures 3 and 7 look like what most people expect to see upon hearing the word 'crater'. Figures 4-6 and 8-11 hardly look like conventional craters. 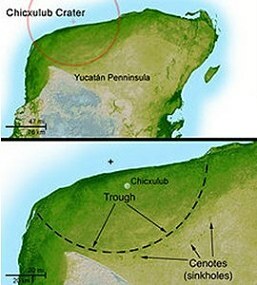 Finally, Figure 12 is a drawing (not a photograph) of what the Chicxulub crater allegedly consists of. A key question here is, are these actually impact craters? Take another look at Figure 7. 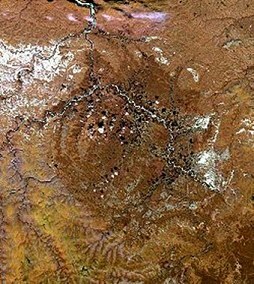 That is what is known as a maars crater - resulting from an explosive expansion of magmatic gas or steam. 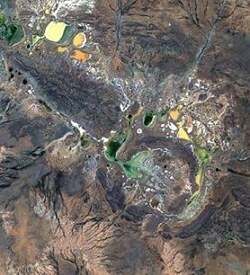 Maars craters range in size from 60 - 2000 meters in diameter and from 10 - 200 meters in depth. By direct observation we know that such phenomena occur. However, there's more to identifying impact craters than this. Impact craters are identified as such primarily by observing certain features. Among these features are: the presence of certain minerals such as coesite, plagioclase that has transformed into maskelynite, stishovite, spherulites, tektites, shocked quartz and rare dense forms of silica, shatter cones, crystal deformations, other shock-related phenomena, melted rocks and others. A group of people hold that some of those minerals and effects cannot be created by any known volcanic action. Other features may be artificially reproduced but only within ultra-high energy conditions (e.g., high-velocity impacts or nuclear explosions). That seems to settle the matter, right? These had to be catastrophic impacts upon Earth and they couldn't have happened in recorded history or humanity wouldn't have survived. No, not necessarily; it's now time to present an alternate view. In 1961, officials at the U.S. Air Force's Cambridge Research Laboratories in Bedford, Massachusetts, were keenly interested in the chemical and physical characteristics of tektites. "Project 7698" was commissioned with W.H. Pinson, Jr. of the Massachusetts Institute of Technology as the principal investigator � Pinson concluded that the theory of formation by random fusion of terrestrial materials "whether by impact of meteorites, asteroids, comets or lightning" could not be supported. NASA scientist John A. O'Keefe published numerous papers between the 1950s and 1990s discussing these lunar rare-earth, isotopic and other chemistries, and how they relate to tektite glass. Thus, some tektite researchers continue to strongly disagree with the popular terrestrial-impact theory; they suggest that tektites are more likely volcanic ejecta from the Moon. 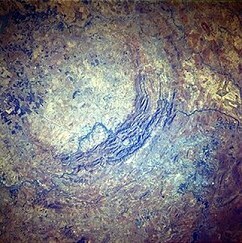 Hence, this alleged 'fingerprint' of an impact crater (namely, the presence of tektites), is far from being conclusive evidence. Additionally, it is known that other volcanic features match what is usually associated with impact craters including crater shape, brecciated rocks, shatter cones and crystal deformations. What this means is that there is no iron-clad way of identifying an impact crater. The physical evidence could be explained by events other than an impact. How would a YEC explain the observations? Here's one suggestion. In our (YEC) worldview there was indeed a major catastrophic event: the universal Flood (Genesis 7-8). I hypothesize that in Genesis 7:11 - when "the fountains of the great deep" were broken up - there were a series of geologic events not unlike volcanic eruptions (recall the maars craters) except that they were significantly more energetic. These could have formed many of the geologic features that today are interpreted as having been caused by impacts upon the Earth. These events would have occurred prior to the Earth being covered with water (in fact, they would have been part of the mechanism that brought about the universal Flood) and, thus, Noah's ark would not have been swamped by kilometric-high tsunamis. I emphasize that this is nothing more than a hypothesis and in no way am I claiming that it is necessarily the final answer to these impact craters questions. 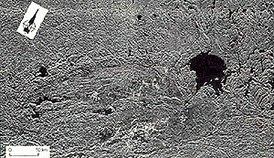 If the breaking of the fountains of the great deep involved maars-like explosions (only much more energetic) then that could explain the geologic features of what today are interpreted as 'impact craters'. The YEC view begins with and adheres to what Scripture unmistakably says. Nowhere in Scripture do we find even a hint of millions or billions of years. In addition, mega/giga-year time scales generate very serious theological problems for orthodox Christianity prominent amongst these being death before sin. As serious as scientific issues may be, theological issues are far more so especially when they entail a significant re-interpretation / distortion of Scripture. Therefore, when faced with a possible conflict we seek a solution that, first, retains what is plainly indicated by Scripture and, second, does not require us to abandon reason or proven science. The impact craters 'evidence' is an instance of this. Upon close and careful examination I find that the 'impact craters' evidence is not compelling, and even less conclusive, than may appear at first sight. Methods for identifying impact craters rely mainly on the presence of certain minerals and on other signs suggesting an impact. However, those minerals and the other signs may be, and in many cases have been, shown to be produced by present geological processes. Even secular, mainstream scientists do not agree on how and when these impact-identifiers may or may not be produced by common geological events. The entire argument appears to be based on conflicting opinions, interpretation of the observations within a pre-supposed old-age worldview and consensus within the secular mainstream community. I then presented a hypothetical scenario (related to the fountains of the great deep in Genesis 7:11) that could explain what today are interpreted as impact craters. In short, and with all things considered, the impact craters argument for an old Earth does not compel, not by any reasonably-critical standard. I do, however, certainly understand how this evidence may appear to be compelling, especially to those that are already standing on a foundation of mega/giga-years. It isn't an irrational argument and if a person accepts, uncritically, the various aspects of the argument then the conclusion definitely points to supporting an old Earth and refuting a young one. The prerequisite is the uncritical acceptance of all of those aspects, in particular that these geological features are actually impact craters. Here the person has to ask whether abandoning the plain reading of Scripture is warranted by 'evidence' that is ambiguous, flimsy and inconclusive. The answer to that question should be abundantly obvious.